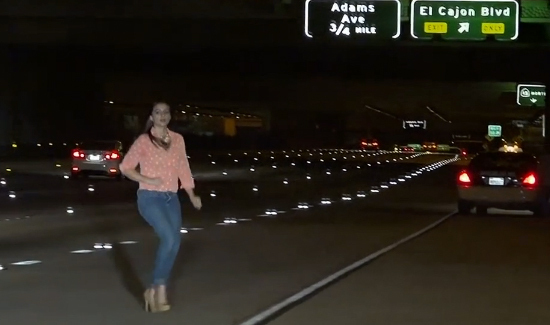 This allegedly intoxicated woman was arrested last Thursday after video captured her wandering in and out of lanes on a San Diego freeway as vehicles swerved to avoid hitting her stalled car. The unidentified young woman got out of her vehicle, which was stopped in the middle of the northbound lanes, and ran across the freeway to ask a KGTV photojournalist for jumper cables, according to the television station. She walked away from the news van toward a motorcyclist and taxi driver who had stopped to help. Meanwhile, multiple vehicles could be seen in the background honking and swerving around the vehicle to avoid crashing into it.